The first day of Spring was just a few days ago. I thought it would be fun to do a little Spring Essentials series. So thats what I am going to be doing this week. First up today is Fashion. I love the transition from Winter to Spring wardrobe. I am kinda a plain jane when it comes to my wardrobe. I love wearing just basic pieces and then accessorizing. So I love a pretty colorful statement necklaces and bracelets. They can really make a plain T-shirt look good. 🙂 Adding a little colored purse into your wardrobe will make you outfit look fresh. I find that this blue color goes pretty well with anything. Having a pair of sunnies is essential anytime of the year. My tops include basic solid color t-shirts gray being on of my favorites. Cardigans are a must in the spring time. I love that you can get these in all different colors depending on the season. I wear chambray shirts all year around, but I love the classic white pants and denim shirt for spring. Since it can be a little chilly a cute sweatshirt is nice to have. When it comes to jeans for the Spring I start to pull out my colored jeans more often. I still wear a good solid pair of denim jeans, but its fun to mix it up with color. Depending on where you live you can wear sandals in the Spring. Here in Las Vegas its already over 80 so I have been wearing sandals. These ones are my all time favorites I just keep buying them and was so excited to see that target had them again this year. A cute pair of flats are great for Spring time to. Like I said I really like basics. I still wear patterns and different textures, but for my EVERYDAY go to things these are the things I wear. 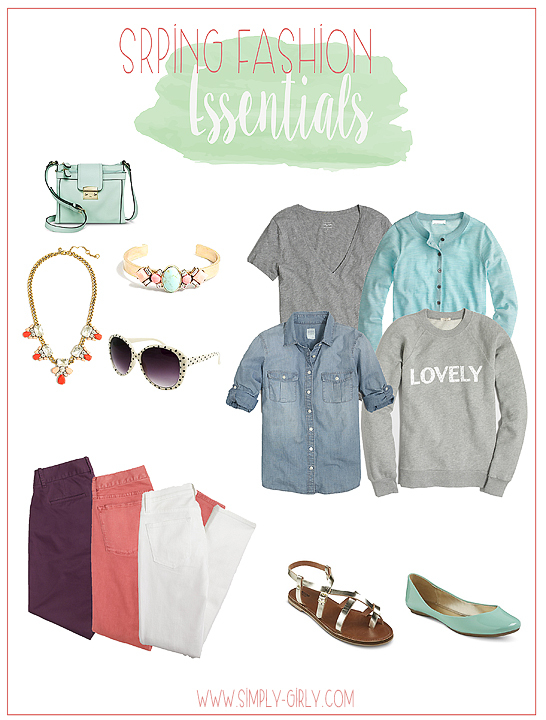 Come back this week for the other parts of this Spring Essentials Series.